Now that he is out of the villain business for good we find Gru is fully housetrained and giving his daughters a birthday party, kissing them tonight, and forbidding the oldest one to see boys. Because of his new role of being a father (and running a jelly and jam business) Gru is actually more likable this time around then he was in the first movie. You'd think three girls would have taken their toll on him, but thankfully the Minions keep the house working like a well-oiled machine. I enjoyed this aspect of the film so well that I was disappointed that the directors felt they needed to bring him back into the game at all. No, he doesn't go back to his evil ways, but he is asked to help find criminals. 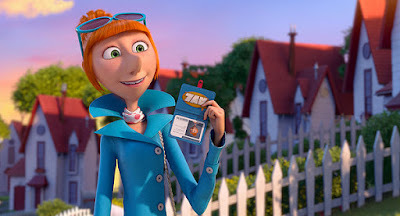 The lady that recruits him is Lucy (Kristen Wiig), a member of AVL (Anti-Villain League). This is an organization that specializes in capturing major criminals (they don't bother with robberies or murders, as those are seen as insignificant) and they want Gru to discover what major villain has stolen a some sort of potion that turns anyone who drinks it into a big purple monster. 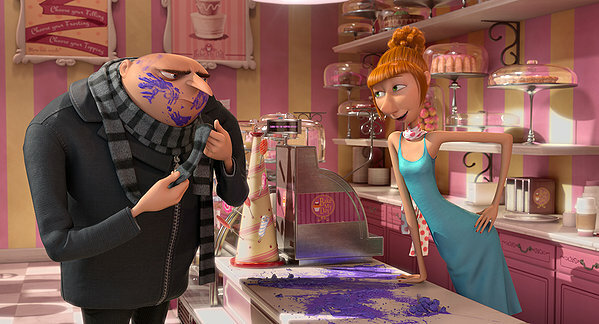 Lucy is assigned to be Gru's assistant and early on it's clear the two are polar opposites in their personalities. What's also obvious is that the two have instant chemistry that makes the audience want to root for them to get together for the entire movie. 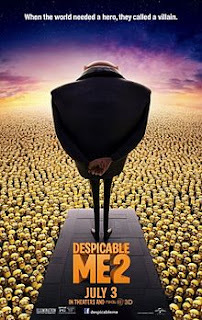 The movie provides lots of action sequences, rapid jokes, and more minions then you could ever hope for. Like the last film I found the villain stuff to be a little uninspired here. The real heart of the movie is the characters and their relationships, and those are still pulled off well here. Though I suspect only adults will be wishing for less comedic action. The kids will be too busy laughing at the sight gags and colorful images. 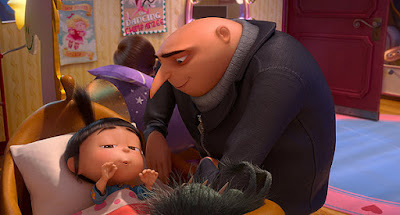 “Despicable Me 2” doesn't have the punch that “Shrek” had nor the emotional depth of “Toy Story,” but Gru is a really unique character, he's likable, and I believe he's going to be around for a long time.